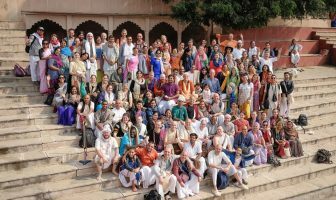 Kartik month in Vrindavan was truly something to behold! 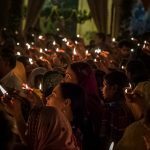 Even if one hadn’t been there, most devotees would have heard the stories and recollections of what a place Vrindavan can be during this sacred month. And Sri Sri Krsna Balaram temple seemed to be right in the middle of it all. The epicentre of all the buzz. 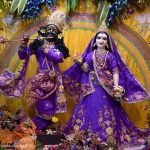 The Banki Bihari temple and Sri Sri Radha Raman temple came a close second and third in terms of vibrancy, energy and being super hives of spiritual activity. 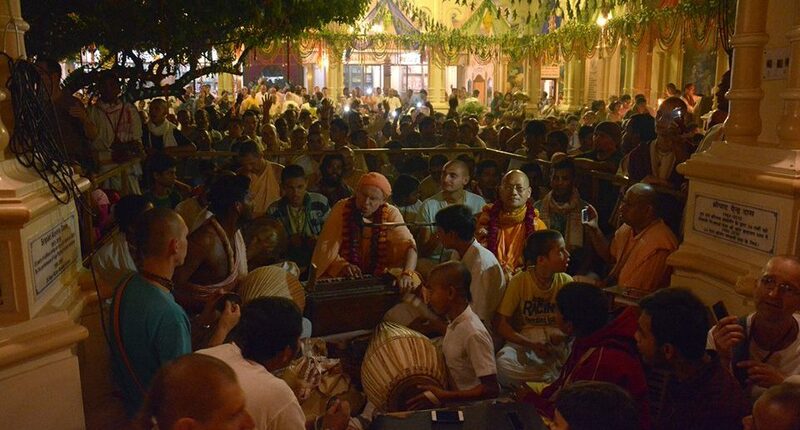 Suffice to say, amongst all the faithful pilgrims coming to imbibe the spiritual potency of the holy dhams, an assorted mix of Kadamba Kanana Swami’s disciples were also there. They also had the added pleasure of knowing that Maharaj would be coming to Vrindavan for Kartik very soon. 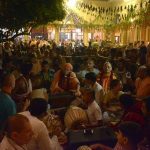 They didn’t need to wait too long… On Wednesday, 28th October at 7.45 pm, Maharaj finally arrived in Vrindavan to an eager reception of happy disciples and well-wishers who all welcomed him with a nice harinam outside the temple guesthouse. Considering Vrindavan is generally as dry as a brick kiln, on that day it was absolutely pouring! We are talking monsoon levels. Maybe Vrinda Devi herself was happy to welcome one of her sons back. Either that or Lord Indra was desiring to instigate a second enactment of the Govardhan Lila!! Maharaj personally was happy about all the rain. He had just arrived from Mumbai which was very hot and Vraj is always so dry, a bit of water could only be a good thing. 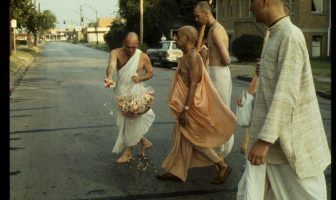 Maharaj was accompanied by young Nimai Prabhu (personal servant and aspiring lawyer from Germany) and Vishvambhar Caitanya Prabhu, one of Maharaj’s stalwart disciples from Radhadesh, Belgium (now based at the Manor, England). They were all coming from the Wada Ecovillage and Maharaj was recovering from a severe bout of shingles. To be fair, Maharaj still wasn’t fully out of the woods. He confided that his nerves were still weak in the legs and the day before he had to drink litres of water as part of his check-up. Nonetheless he was in good spirits. In a little while, Maharaj was settled in his room. Well furbished and clean, he sat on a couch while his disciples surrounding him on the floor. Soon the German jokes started coming out thick and fast. Bear in mind, most of the disciples present were of German origin. Other disciples also started streaming in, including the wonderfully vivacious Gita Govinda Mataji, a spirited lawyer from Holland. Maharaj then mentioned to Mataji how young Nimai wanted to be a lawyer and then made a joke about a lawyer on a ship who jumped in with the sharks and didn’t get bitten. Why? The sharks gave him “professional courtesy”!! Everyone cracked up. Looking at the soft cushions and bed in his room, Maharaj started joking about the ‘kasipu’ in his room (referring to the meaning of bed in Hiranyakashipu’s name) and how opulent it was. This was followed by a few more witty comments on the renunciation of a modern day vaishnava. He then mentioned how he had never technically owned a house, even as a householder! Thursday and Friday, Maharaj took it easy with some well-earned rest. However, for Maharaj resting is never a 100% rest. 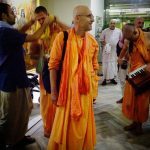 Someone with his personality and energy can’t stay dormant for long, so on both these days Maharaj did get stuck into some high octane evening kirtans in the temple room. Friday evening at 7pm, Maharaj started off by singing the evening Damodarastakam prayers. 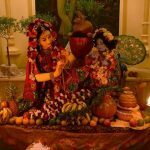 The setting was perfect, everything was in its element – the temple, the devotees, Maharaj and the whole of Vrindavan herself. It was a balmy Indian evening. The temple was packed and heaving to the limit. Sparkling candles were everywhere like sparkling stars in the night sky. There was a beautiful emerald-green canopy which was engulfing the three main altar areas and then spilling out into the walls and corners of the temple interior. There were also garlands decked out everywhere, all-in-all the whole temple was a multitude of colours. The crystal chandeliers in the ceiling were dimly lit and the combination of light against the dark gave a beautiful orange glow to the whole area. It would have been boiling inside but thankfully the fans were giving a nice gentle breeze and there was the fresh air coming from the open air courtyard section. Devotees of various colours and backgrounds were slowly moving around offering candles to the deities; resembling an ocean of circumambulating cows of different hues and shades. Maharaj was seated near the front section of the temple near the altars, surrounded by disciples and expert kirtaneers and musicians. Just behind him to the right was the famous shelter giving Tamala tree of the temple courtyard and surrounding the sides of the courtyard were these exquisite Rajasthani arches. Above the delicately lit courtyard, looming in the black sky was the magnificent Vedic style tower of Srila Prabhupada’s Samadhi. In the midst of this sublime setting, Maharaj was singing the prayers so gracefully with his deep, silky voice. The overall effect was really stunning. 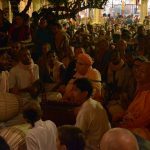 The prayers were sung in a slow, sombre mood and then Maharaj effortlessly raised the groove for the ensuing kirtan that would carry on into the starry Vrindavan night. Wow Govinda! Wow Krsna Murari! I will never forget that night as long as I live! It was an explosive, rhythmic, crazy but incredibly melodious kirtan of stratospheric levels. 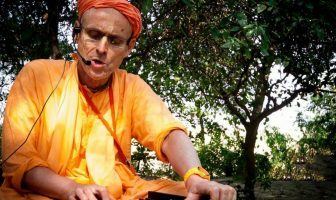 The kirtan seemed to contain a range of rasas that went from sweet to chivalrous, interspersed with some parental lullaby style singing for Sri Krsna as well. Maharaj really seemed to be at home in this environment. If the kirtan could be described in terms of colours, it would have been a range of colours with each colour exhibiting full splendour. Some of the men were dancing like cowherd boys, as if in a parade following Krsna. Others were musically marching as if like soldiers marching to an anthem, complete with the smashing of wompers and kartals. And then there were those who were individually bopping away. The women were going round in graceful, circular movements and doing elegant ‘Gopi style’ dancing. The temple room felt like it was going through a transcendental earthquake; full of musical tremors. Personally, I felt my heart melting but also splashing due to the eruptions of divine molten lava coming from Maharaj’s volcanic sound vibrations. And I knew then that my material conditionings were being thrown out of orbit. It was a truly epic, life changing experience. After Maharaj wrapped up his kirtan, the famous kirtaneer Madhava Prabhu came on to continue the kirtan. For me, Maharaj’s kirtan became more internal, as it continued well into my sleep! HH Kadamba Kanana Maharaj ki Jai! !